Duff Beer is a brand of beer that originally started as a fictional beverage on the animated series The Simpsons. Since then it has become a real brand of beer in a number of countries without permission or consent from its original creator, Matt Groening, and has resulted in legal battles with varying results. An official version of the beer is sold in three variations near The Simpsons Ride at Universal Studios. 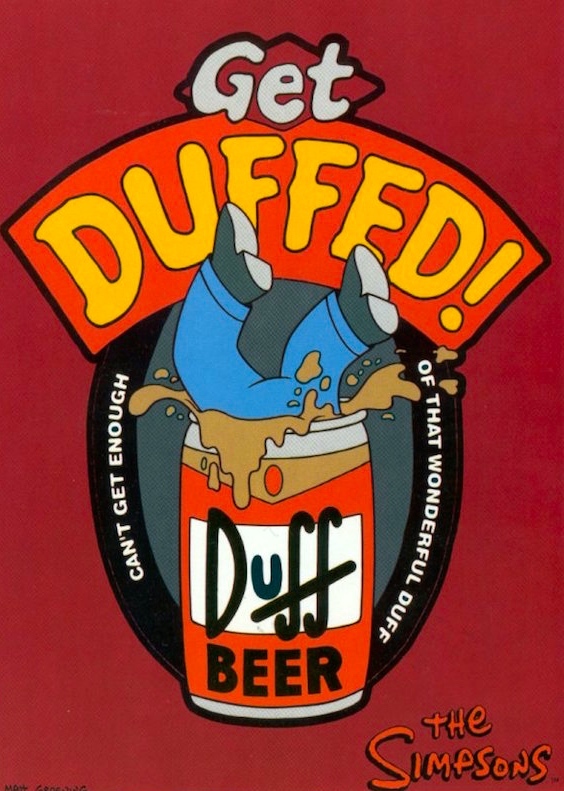 … Duff is Homer Simpson’s beer of choice. It is a parody of stereotypical commercial beer: cheap, poor-quality, and advertised everywhere. In “Duffless”, parking lot signs at the Duff brewery have the slogans “It’s Always Time For Duff” and “Now Leaving Duff Country”. 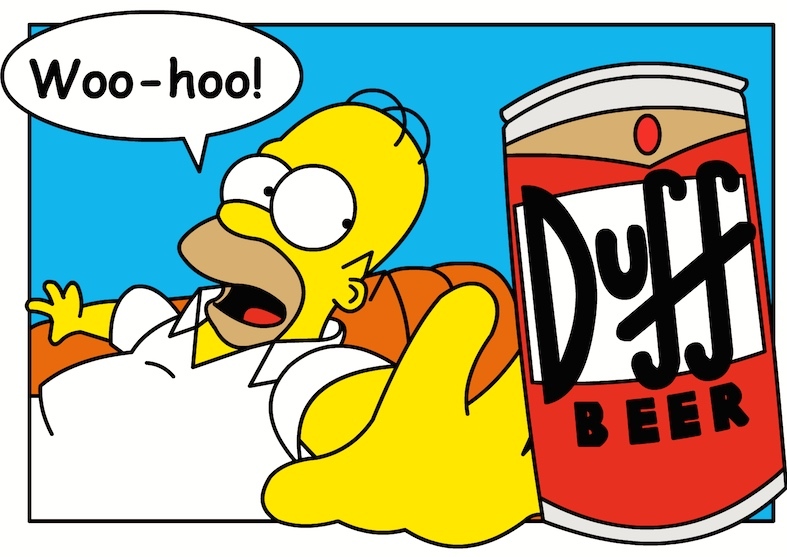 In “Homer’s Odyssey”, Duff is described as “The beer that makes the days fly by”. 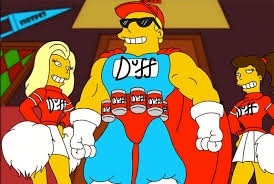 Their spokesperson is Duffman, a parody of Budweiser’s ’70s-era mascot Bud Man. He is a muscular, bleach-blond, well-tanned man with whitened teeth who wears a blue leotard and cape, red Duff Beer ballcap, mirror sunglasses, and a utility belt full of cans of Duff Beer. The challenge of protecting fictional brand names has previously been discussed in World Trademark Review. An oft-used case study is the fictional Duff Beer, which features in TV show The Simpsons. The show’s owner, 21st Century Fox, has faced numerous companies launching Duff Beer in the real world and this week announced it was entering the beer market in Chile, partly as a bid to fight off third-party use of the brand. The company also announced that it plans to rollout Duff Beer in Europe, but a number of challenges lie ahead. Since iconic animated sitcom The Simpsons began in 1989, recognition of the red, white and black Duff Beer brand has grown. The popularity of The Simpsons has made it a billion-dollar merchandising industry, but show creator Matt Groening has previously stated on-the-record that he did not want an officially licensed Duff Beer alcoholic beverage on the market due to the show’s young audience. Therefore, many of the DUFF BEER marks registered by 21st Century Fox (then called Twentieth Century Fox) around the world (including in Europe, Mexico and the US) covered non-beer related goods (such as T-shirts and soft drinks). This entry was posted on July 19, 2015 at 2:22 am and is filed under Language and the law, Language in advertising, Linguistics in the comics, Movies and tv, Names. You can follow any responses to this entry through the RSS 2.0 feed. You can leave a response, or trackback from your own site.